Raw instinct takes over in this new, adrenaline-pumping journey into Survival Horror. Something is terribly wrong. Your covert mission to infiltrate an isolated research compound, has gone haywire... now you find yourself pursued by a relentless, pre-historic terror. Suddenly, your mission becomes a desperate fight for survival. 04-22-2016 mrfoxhound Box Text RAW INSTINCT TAKES OVER From the creators of RESIDENT EVIL Raw instinct takes over in this new, adrenaline-pumping journey into Survival Horror. Something is terribly wrong. Your covert mission to infiltrate an isolated research compound, has gone haywire... now you find yourself pursued by a relentless, pre-historic terror. Suddenly, your mission becomes a desperate fight for survival. 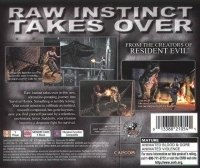 03-25-2013 empovyle Box Text RAW INSTINCT TAKES OVER From the creators of RESIDENT EVIL Raw instinct takes over in this new, adrenaline-pumping journey into Survival Horror. Something is terribly wrong. Your covert mission to infiltrate an isolated research compound, has gone haywire... now you find yourself pursued by a relentless, pre-historic terror. Suddenly, your mission becomes a desperate fight for survival. 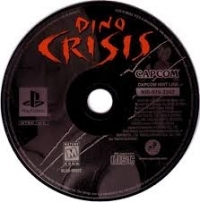 This is a list of VGCollect users who have Dino Crisis in their Collection. This is a list of VGCollect users who have Dino Crisis in their Sell List. 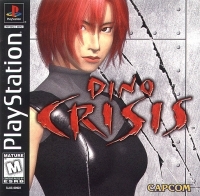 This is a list of VGCollect users who have Dino Crisis in their Wish List.